Four years ago we moved to AZ so Husband could attend dental school. We had one car. One little compact car. Cute, but cozy. And we had one kid. We lived pretty close to the school but my husband drove the car to school. Where I live there are lots of stores within walking distance so I just pushed the stroller everywhere I needed to go. It worked for awhile. But then it stopped working. It got hot. I was sick of walking everywhere and I wanted to go places that were further away than walking distance. We tried the whole drop-you-off pick-you-up routine which was super annoying. We tried having my husband carpool, but the guys driving left SUPER early. We tried having my husband ride a bike. He discovered a new knee problem, yay! And we’d just had baby #2. Guy: Okay I’ll give you that deal but I CANT go any lower. Guy: Alright fine, I can give you THIS new cheaper deal but seriously, if I go any lower I will be losing money. Guy: OKAY! You twisted my arm, I will give you the low price you originally came in wanting!! We walked out on that guy. Mostly because the Rav4 was just not what we really wanted. It was too small. So we headed back over to Honda and they welcomed us with open arms, like one of the family. And they (meaning a friend of ours who worked there) gave us a stellar deal. 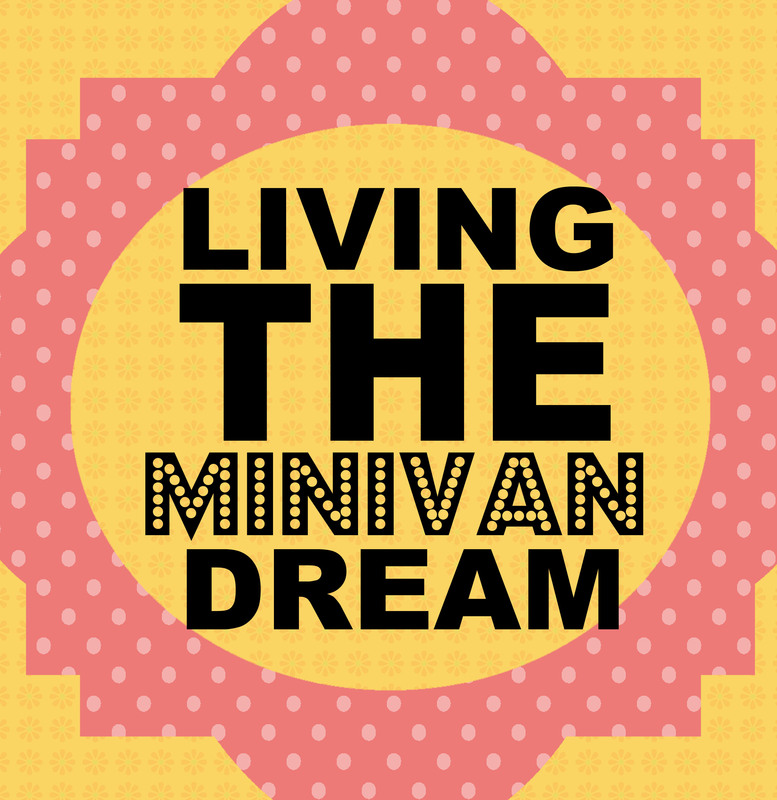 We were hesitant to embrace the Life of the Minivan and all that entails (such as my current haircut.) It was goodbye to youth, goodbye to the carefree and sporty versions of ourselves. Goodbye to driving down the coast in a convertible as we toss scarves over our shoulder doing the snooty laugh. Bwa-ha-ha-ha! But once we did, we never looked back. Gone were the days of scooting the passenger side chair all the way up to fit in our carseat and taking the wheels off the semi-truck double stroller to cram it in the trunk. Our van fit everything. And I mean EVERYTHING. We visited Utah for two months this summer and on the way back it was packed to the ceiling, literally, with our stuff. No more borrowing trucks from people when we needed to transport a large piece of furniture. It seats all our kids and us plus two more. ‘Nuff said. I can drive like a maniac and not get pulled over by the police cuz really, do they even LOOK at minivans? They just blend into the asphalt. Also I love making unexpected swift maneuvers around smaller cars. My engine’s got game, yo. They look at my car and imagine some cranky lady in hair rollers (they’re half right) and would never expect it. I guess I get to do the snooty laugh after all! But don’t worry, I NEVER drive like that. I drive 10 mph below the speed limit at ALL times. I am a Cautious Carl. Maybe. Funny! And I for one can attest to the extreme squishiness of being in the front passenger seat w/ the carseat behind. One day I hope to drive something fun like the RAV4. The ones w/ the 3 rd row in the back are great for so many reasons- but not right now when I have so many little kids. 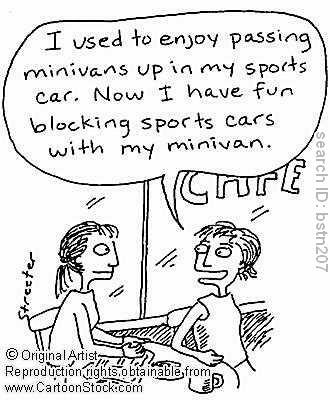 I LOVE minivans! I think it’s so funny, so many of my friends absolutely hate them and will not drive them. My SIL had one and sold it because she hated it so bad. I told her she’d love them one day…she now has not one, but TWO! bwahaahaa!! Good to know! I’ll have to join the club soon enough! Oh, how I miss you! GREAT post! 🙂 Let me know when you saw off the top of the minivan. I wanna ride!! SO funny! My hubby was the one who wanted a mini van so bad . . . I did not. BUt we have had our Odyssey for 6 plus years now and I love it like it’s one of the family. Maybe we can ride down the cost together- bwa-ha-ha-ha! Wow, crazy! I can’t stand car salesman, they’re the worst! I’m glad you got yourself a new vehicle, better than walking in the heat! Whew!